TonyBet is a European gambling site that finally starts accepting Bitcoin for its wide range of casino games, sports betting, and poker. TonyBet recently changed its policy about Bitcoin and has started to accept it. Though already popular, this move added more to the online casino’s player base. Online gamblers will appreciate all of the options that TonyBet gives its players. 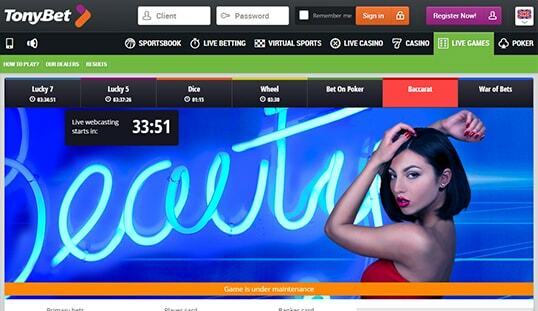 Based out of Lithuania and owned by Tony G, a prominent poker player, TonyBet was launched back in 2009. The original intent was to serve as a European gambling site. This is reflected in the site’s licenses from UK, Lithuania, and other European countries. 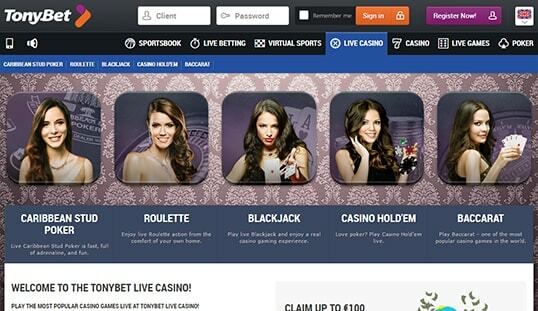 The site has a solid gaming platform from Microgaming and has partnerships with other developers. Players from the US, the UK, Spain, and France, however, are restricted from the online casino. TonyBet has a variety of gaming options that should please any interested gambler. First, there are the standard casino games like slots and blackjack. Next, there are the sports betting options. Players can place pre-match bets or even in-play bets on the site. Finally, TonyBet has live dealer games for those who want the personal touch. The site has recently begun accepting Bitcoin, which makes all of these games acceptable. TonyBet can be accessed either from its main webpage or through its app. Both access points were well-designed, though the app has less gaming options. The main site delivers the whole experience and presents it in a quick and intuitive manner. All parts of the site can be reached with just a single click, making everything easy. With the casino supporting both instant play and mobile platforms, expect the games from NetEnt, Betgames, and NYX to function well. TonyBet started out as a fiat currency casino, so it really has stringent requirements when it comes to account information. Besides asking for basic account details, the site asks for your real name, date of birth, address, and your contact information. TonyBet allows withdrawals and deposits via many different methods. Credit cards and e-wallets are a popular option, while the site has recently added Bitcoin to the choices. Deposits take a few minutes for all transaction options, while withdrawals can take days for some of them. Bitcoin can allow players to withdraw their winnings in just a few minutes. There is also a €3000 withdrawal limit. Bitcoin payments are done via SpectroCoin, so Bitcoin players are guaranteed of on-point processes. 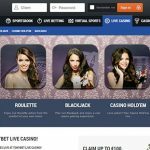 TonyBet has several promotions linked to different parts of the site. First, there is the sportsbook bonus. All you need to do is make a first deposit of at least €10 and wager it six times within 14 days with the odds of at least 1.60. 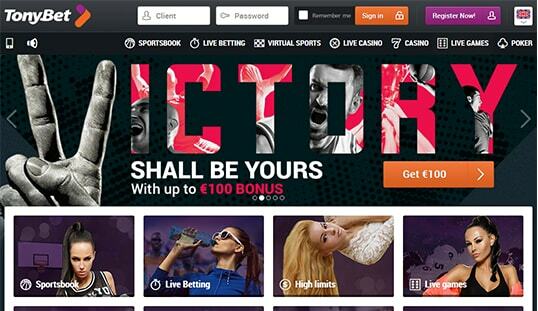 You will receive a 50% sportsbook bonus up to €100. Second, there is the casino bonus. Deposit at least €10 and you will be entitled to a 100% casino bonus up to a maximum of €100. Next, there are the 20 free spins for Starburst. Players get this bonus every week. Finally, the poker rooms have a started bonus. Players have a bonus of 100% up to €2,000. The site can be played on mobile devices. The HTML5 source code makes it very adaptable. The app can also work on various platforms. The site has live and phone support for instant answers. It also has email if both these options are unavailable.